Classes, meals and sports are conveniently all available on one site. The area of Headington caters especially well to students with shops and cafes on your doorstep. The historic city centre of Oxford, home to England’s oldest university, is just a short bus ride away, waiting for you to discover. It's a great way of combining your English studies with sight-seeing and a lot of fun! Sports: Football, softball, basketball, volleyball, badminton, aerobics and table tennis. Non-sports: Show rehearsals, crafts and treasure hunts. Evening activities: Blind date, international show, discos, talent show, fashion show, 'It's a Knockout' and karaoke. The programme includes one full-day excursion by coach each week (London, Salisbury, Stratford-upon-Avon) and three half-day excursions each week. Two of these are into Oxford. The third half-day is an excursion outside of the Oxford area. Lessons: 20 lessons per week, from Monday to Friday. There is a maximum of 15 students per class. Curfew: students are not allowed to leave the campus without supervision. Supervision: 24 hours/7 days a week. Airport transfer: not included, please see rates on our online price list. Our summer English course will rapidly improve your level of ability in a short amount of time. 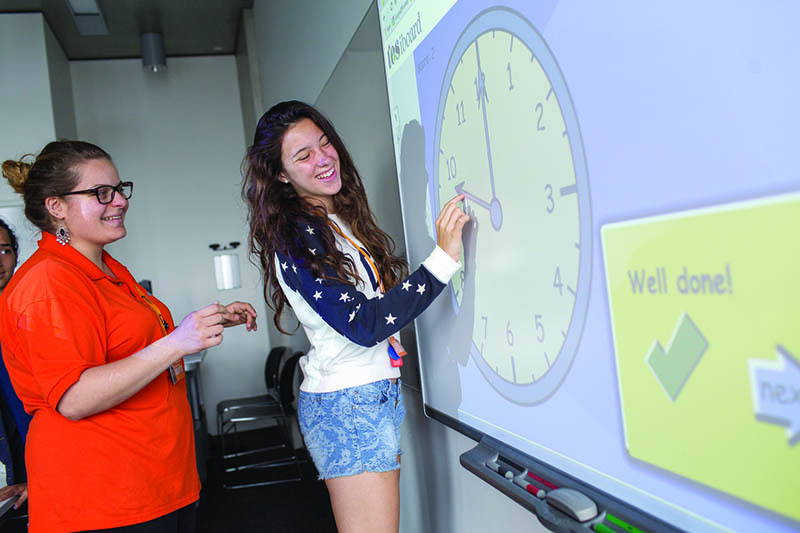 With a maximum of 15 students per class, you will enjoy learning through exercises focusing on speaking and listening. School teachers are highly qualified and students receive 20 lessons per week in English each week, divided into 4 lessons per day. There are mixed nationalities in each class. In the very first English class, students are asked to take an English test. The test includes writing, vocabulary and an oral interview. This allows the school to place you in the right class for your ability level. The youth course also includes stay in a host residence (single rooms in flats of 5-6 students) with full board, an activity programme, 1 day- and 1 afternoon excursion, and 2 visits of Oxford per week and the use of teaching materials. The juniors course is available from 1 week onwards, but we recommend a minimum stay of 2 weeks. Accommodation Damage Deposit: A cash deposit of € 37 against room damages is collected on the first day of school. This has to be paid by all junior customers. The deposit is returned to the students (unless any damages are done), upon their departure. London Gatwick: GBP: 290 p.p. Please fill out on the booking form at which airport you will arrive. Embassy Summer school students are housed in standard rooms in the Clive Booth Halls, a short walk from the main campus. These residences are two-storey blocks of flats, with green land surrounding. They are convenient for sports and leisure facilities. Students will have a standard single study bedroom, containing modern furniture. Rooms are arranged in 'flats' with 5 – 6 rooms in each flat, sharing 1 - 2 shower rooms, toilet and a kitchen-lounge area. On the campus there is a big eating area, several sportfields and a gym for in- and outside activities. Next to all kinds of activities such as; football, volleyball and disco nights, there are also excursions in the afternoons, evenings and weekends.